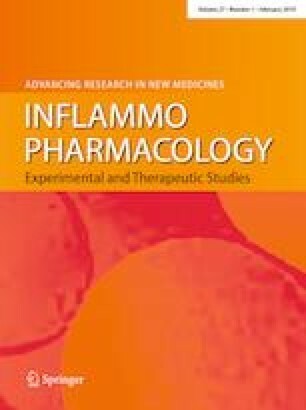 In continuation with our previous studies on osthole, bergapten, a closely related furanocoumarin was investigated for its ameliorative effect on chemically induced neurogenic and inflammatory hyperalgesia and inflammation in mice. Chemical hyperalgesia and inflammation was induced by administration of formalin (intraplantar), acetic acid (intraperitoneal) and carrageenan (intraplantar) to different groups of animals. Pain responses were quantified and median effective dose (ED50) of bergapten was calculated. Lipopolysaccharide challenge was administered to study inflammatory cytokines which were analyzed in plasma using ELISA. The expression of poly ADP-ribose polymerase (PARP), cyclooxygenase (COX-2) and inducible nitric oxide synthase (iNOS) was quantified by immnofluorescence staining. Bergapten was found to ameliorate both neurogenic and inflammatory hyperalgesia precipitated by formalin, acetic acid induced writhing and carrageenan induced paw inflammation with ED50 dose of 2.96 mg/kg. Bergapten also significantly decreased the levels of TNF-α and IL-6 and the expression of PARP, COX-2 and iNOS in the spine. It is concluded that bergapten is an interesting molecule with significant analgesic and anti-inflammatory activity emanating through the modulation of multiple pain mediating pathways. RB is thankful to Department of Science & Technology, Govt. of India for financial support (Grant No. EMR/2016/005878) under Extra Mural Research Project. GS and AK are thankful to the University Grants Commission (UGC) (Grant No. F1-17.1/2017-18/RGNF-2017-18-SC-PUN-35330), New Delhi for scholarship under NFSC and MANF scheme respectively. The authors also gratefully acknowledge the facilities provided by the UGC (Grant No. F1-17.1/2017-18/MANF-2017-18-PUN-84339) under university with potential for excellence (UPE) scheme.